Manufacturer of a wide range of products which include electro mechanical contact coder. We are amongst the most prominent enterprise actively engaged in providing Electro Mechanical Contact Coder. The offered coder is provided in number of customized options. Offered coder is manufactured using quality materials with the help of competent professionals. We offer this coder on several specifications as per the requirements at competitive rates. 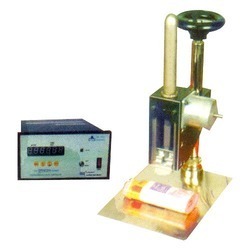 Printing speed: Upto 110 Imp/ min. Looking for Electromechanical Contact Coder ?